Saymaly Tash gorge means “embroidered ornamental stone” is located high in the mountains of the Fergana ridge, at an altitude of 3000 meters above sea level. It is better to visit the gorge once a year, as the rest of the year is under the snow. 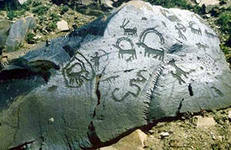 There are many petroglyphs in this beautiful and interesting place. Having visited Saymaly Tash gorge, you have a unique opportunity to see many images of animals of different species. This is numerous scenes of hunting goats, deer and other animals, many pictures with scenes of ritual dances or ceremonies, as well as images of mountain goats and argali. But the most favorite image was the image of a goat. Great interest is attracted by images of bulls: a powerful body, small head and long horns. Images of deer are made in different styles and techniques, as drawings were presented in different eras. They can be often seen alone: long legs, elongated snout and short tail. There are also many images of horses: well expressed graceful head, ears, tail, long legs. Here you can find images of mythical and winged horses, as well as images of wolves having a distinct characteristic features: a powerful body and a large head with a grin. Saimaly Tash has images of other animals that that are sometimes very difficult to recognize. These figures resemble tigers, lions, bears and other predators, as well as other creatures such as centaurs. There are also images of the person in Saimaly Tash patterns. Saimaly Tash is one of the wonders of Kyrgyzstan, attracting thousands and millions of tourists from around the world.